On June 18, 1983, Sally Ride became the first American woman to fly in space when the space shuttle Challenger launched on mission STS-7 from Pad 39A at NASA's Kennedy Space Center in Florida. The STS-7 crew consisted of astronauts Robert Crippen, commander, the first two-time space shuttle astronaut; Frederick H. Hauck, pilot; and three mission specialists -- Ride, John M. Fabian and Norman E. Thagard. 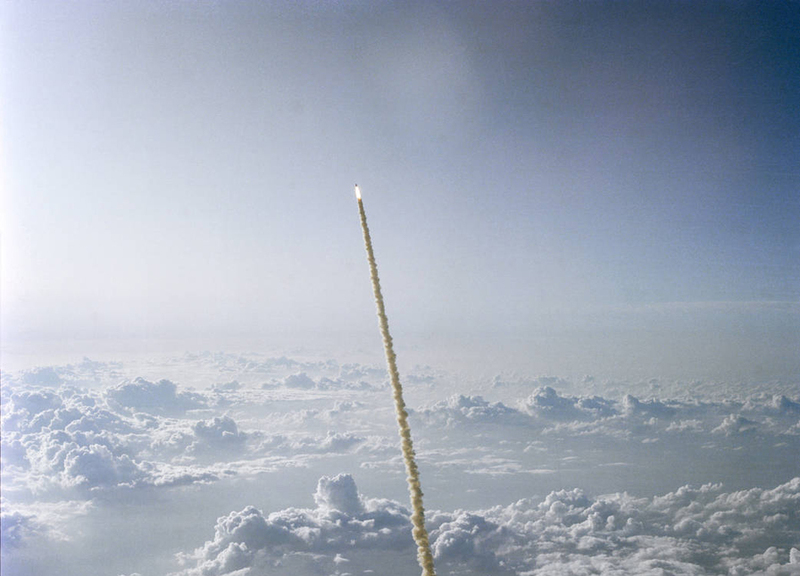 This high-angle view of the shuttle liftoff, showing a lengthy stretch of Florida Atlantic coastline and a number of large cumulus clouds, was photographed with a handheld 70mm camera by astronaut John W. Young, who piloted the Shuttle Training Aircraft (STA) for weather monitoring at launch and landing sites for STS missions. One of Sally Ride's jobs was to call out "Roll program" seven seconds after launch. "I'll guarantee that those were the hardest words I ever had to get out of my mouth," she said later.